Thursday news – PREAKNESS set to go Saturday…long weekend in Canada with 3 racing days this weekend…go Emma!! 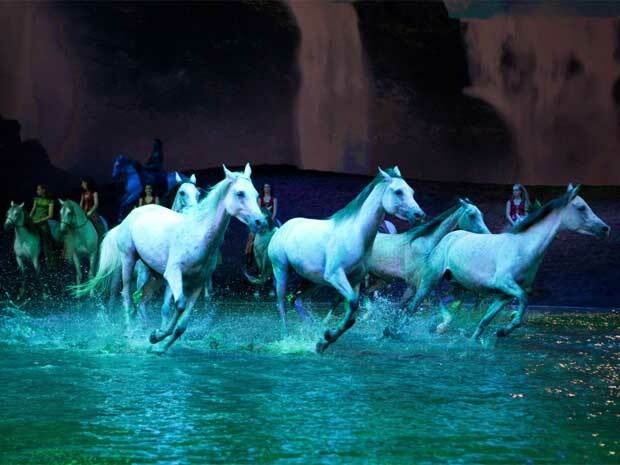 ABSOLUTELY go and see CAVALIA: ODYSSEO, forget what you know about Cavalia, this is stunning, live music gorgeous horses, incredible sets. It’s in Toronto right now. The Female Jockey Challenge has been expanded for 2012. 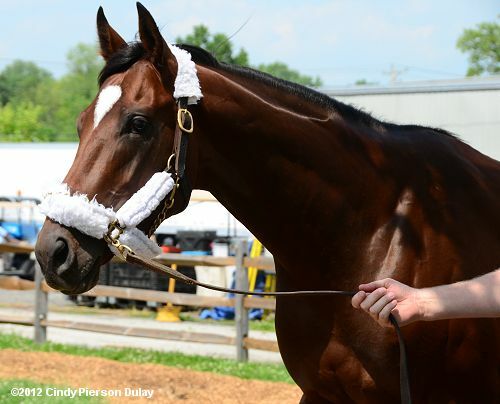 Rosie Napravnik, who leads all female riders this year in wins and purses, and Emma-Jayne Wilson, the Canadian-based defending champion, both return for Pimlico’s second annual edition. They are joined by fellow returnees Forest Boyce and Vicky Baze, and newcomers Rosemary Homeister, Tammi Piermarini and Greta Kuntzweiler. The challenge was expanded from six to eight riders this year, but will be without Abby Fuller, who dropped out following the death of her father, Peter Fuller, on Monday. Peter Fuller bred and owned Mom’s Command, who Abby Fuller rode to the New York filly Triple Crown in 1985. In the challenge format, riders will earn points for finishing first (12 points), second (6), third (4) and fourth (3) in four designated races: the 2ND, 3RD, 5TH and 7TH. The jockey with the most points at the end of the competition will be crowned champion and take home top prize of $10,000. BALTIMORE — D. Wayne Lukas yesterday fired a broadside at three Kentucky Derby winning trainers whose actions, he said, embarrassed him and the sport. In a rare break with the code of silence found at the track, he singled out Doug O’Neill, who won the Derby two weeks ago with I’ll Have Another, Richard Dutrow Jr., who won the 2008 Derby with Big Brown, and Chip Woolley, whose huge longshot Mine That Bird won it in 2009. O’Neill is challenging a charge in California that he “milkshaked” a horse (illegally dosed it with bicarbonate of soda, sugar and electrolytes to reduce fatigue), Dutrow is appealing a 10-year suspension for numerous drug violations, and Woolley was banished from an Iowa casino for allegedly urinating on its slot machines. “As a trainer, at this stage of my career, I am embarrassed by all this stuff,” Lukas said. “I wish we could get more positive publicity for the sport, but we have to deal with these things, they’re right there in front of us. jockey, Mario Guttierrez, was, until recently, racing mainly at Hastings Park in Vancouver. Well, now you can add a Manitoba connection, too: I’ll Have Another has the same mother (Arch’s Gal Edith) as When Willy Win, who’s been racing for local trainer Clayton Gray after being claimed from Ardell Sayler last year. Their sires are different, however: I’ll Have Another was fathered by Flower Alley and When Willy Win was fathered by Soto. Larry Jones poured his heart into his hockey career as a young boy growing up in Alberta, Canada, skating on frozen parking lots for what seemed like days at a time. “My mom pretty much had to call 911 to get me away from the arena,” he said from the barns at Pimlico, where he is helping care for Kentucky Derby winnerI’ll Have Another. The end of Jones’ hockey career helped him find what would be next. He played two years in the WHL, one of Canada’s elite junior leagues, until a back injury slowed his development. Surgery and other treatments proved unsuccessful, and Jones turned to a chiropractor in Calgary, who fixed him up after 12 days of intense therapy. A correspondent friend has reported that MARITIMER, Canada’s champion 2yo colt of last year, has left Dubai and is now in New York with trainer Seth Benzel. RAINCOATS’NTUXEDOS did not have a very good start from the gate in last night’s allowance race at Woodbine for ONtario sired 3yo’s but he still zoomed to the lead and won in 1:08.98 for his 3rd win in 6 races. The dark bay colt was a $2,000 purchase at Keeneland September in 2010 by Span Investments. The colt races for Ninela Thoroughbreds INc. and trainer Abraham Katryan. He is a son of former Ontario sire WEATHER WARNING out of the Belong to Me mare Dancewiththebride (clever name, Raincoats…Tuxedos). The Beyer Figure for 1:08.98 was on the low side – a 79. RACE 1 – SHARP SECRETARY dropped in class for her first start in more than a year – stakes to just $32,000 claiming. The 5yo stakes winner, who has made over $239,000 seems to be in racing mode this year rather than being bred. She is trained by Lorne Richards for Landsdowne Stable. 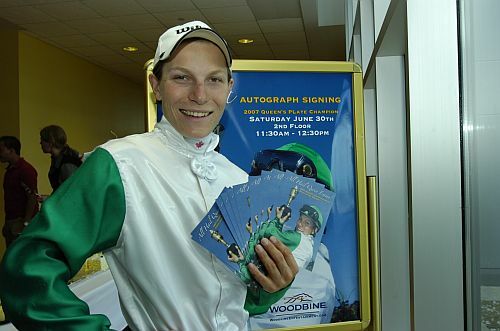 Emma-Jayne Wilson, who rides at Pimlico tomorrow in a jockey challenge, was on board. race 2 – WAITINGINTHEWINGS is now 2 for 2 in her career as she won the Otario sired allowance race for fillies and mares. The daughter of Niigon had the highest last-race Beyer Figure in the field from her debut win, only a 48, but it was enough to beat a very weak field. Colebrook farms bred the 3yo and Justin Stein rode. SMART SKY won race 3 off a November 2011 layoff and he was the 7th winner for the Mike Doyle barn already in 2012. Scott Abbott owns the 5yo by Sky Mesa and Tyler Pizarro rode. race 4 was won from off the pace by CINDY’S JOY, a 5yo mare by Kitten’s Joy, owned by Donver Stables, It was the 7th win for the Josie Carroll barn and Pat Husbands rode the mare to her 2nd win in her 18th start. A very busy SAMANTHA ROYALE led all the way to win her maiden for $16,000 in race 5. The Chapel Royal 4yo filly was making her 6th start since March 15 and on April 29, she was 10th beaten 25+ lengths for $20,000 claiming, so that is a very bizarre reversal of form for the Vern Fernandes runners. Maxine’s Pride was beautifully ridden by Quincey Welch to win race 6 for $25,000 claiming. Trained by Ricky Griffith, the Debmar Stables filly is by Saffir and she was dropping to $25,000 claiming. The last race went to MR. ROD, the game 6yo who is 2 for 3 this year and he is currently owned and trained by Scott Fairlie’s Ace Racing. Todd Kabel picked up the mount when Michelle Rainford booked off. Horse to watch from that race is GLORY GAME, who was checked and steadied throughout most of the race and then closed well.